If you heart your pet as much as we heart our dog....you must check out D Pet Hotel 1041 N Highland Ave, in Hollywood. 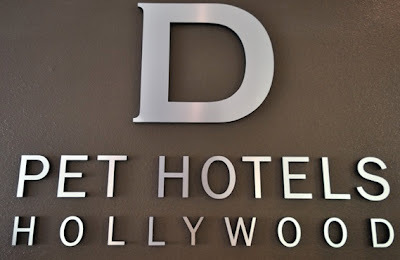 D Pet Hotel located right in the center of Hollywood is pretty much the W -- for the dogs. The luxury resort boast everything from standard "Bowwow" suites to their uber double suite complete with a queen size bed and a 42-inch flat-screen TV. It also boast other perks for you to heart: three dog parks spanning 6,000 square feet, a state-of-the-art grooming and spa center and chauffeured transportation. The placed is staffed 24/7 and even has a vet on call. I often bring my dog to a pet salon just like this one specifically to kennels Long Island to pamper my pet. What I like about these kind of salons is, they've got all the high-end facilities that will surely pamper my puppy. What is the brand of their professional dog grooming supplies? I want to buy expensive grooming materials because I want the all the best for my dog.